From now until the celebrations of the SWF’s fiftieth anniversary, we shall post memories of ‘former greats’ of the association. I am not the oldest: only 33 years with the SWF… When I arrived it seemed to me it would be a good idea to highlight an aspect of Furtwängler that had been rather neglected: the composer. In 1989, for the twentieth anniversary of the SWF, the association organised a grand Furtwängler evening marked by the French premiere of his Second Sonata for violin and piano. Members of the Furtwängler family, led by Elisabeth, had come over especially for this. 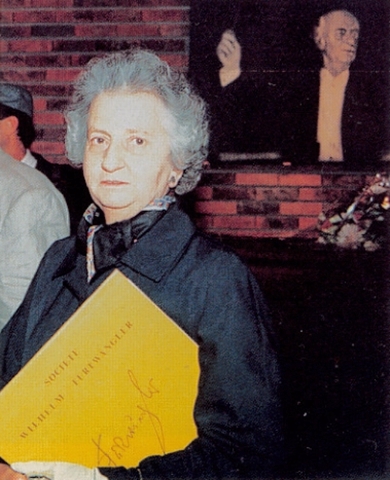 To mark the occasion we ‘ceremoniously’ awarded to Dagmar Bella-Sturli (1920-1999), one of Furtwängler’s daughters, and a pianist and teacher in Vienna, ‘her’ disc, in other words our vinyl record of the concert that included Mozart’s Concerto for two pianos, in which she was the partner of Paul Badura-Skoda, both being accompanied by the Vienna Philharmonic conducted by her father (8 February 1949). We made this record from an archival tape acquired (at some cost…) from Badura-Skoda. The next day she came to our home for lunch with Elisabeth and Andreas. I played the record for them. She smiled and announced: “Yet that is not myself… I remember very well: I was the first piano, Paul the second; now I readily recognise the hand of Paul, but on the first piano…, it is not I who am playing”. PS: This ‘fake’ Furtwängler has since been identified: Badura-Skoda was playing alongside Jörg Demus, Hans Swarowsky wielding the baton. Previous Previous post: Ah! Grandpa’s shirts!